This quote comes from a quote-a-day calendar that belonged to my Dad. When us kids were all grown-up it got passed on to my husband as we started having children and needed some sage advice. This statement has been staring at me for a couple of weeks. Neither Ice nor I have changed the date over. I guess we like the reminder. Recently we celebrated Little Bee’s second birthday. She loved the blowing out of the candles. It was the first time she was old enough to understand and make an effort. She called it her “special cake”. She thought it was just going to happen every day. So the day after her birthday, night time rolled around and she asked for “special cake” and wanted to blow out the candles again. Nothing fancy. 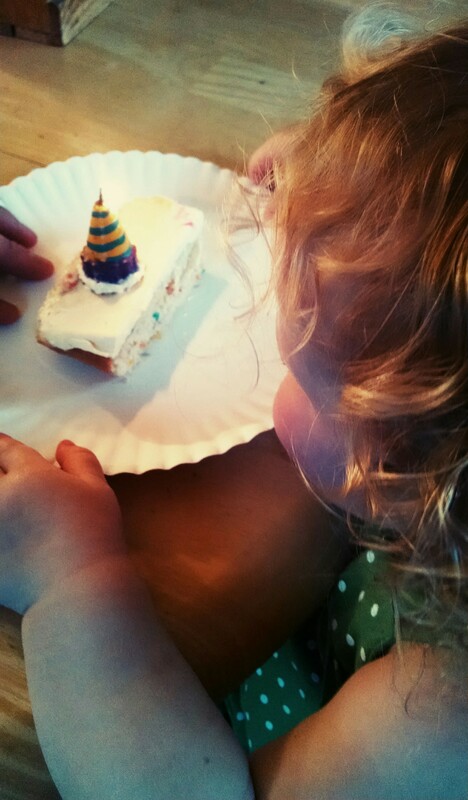 Not the “Birthday Plate”, just a paper plate. Just a leftover, already-been-burned-candle. It made her so happy. It struck me then how many ordinary moments and ordinary days can become extraordinary with a little effort, a little sprinkles on top, a little sparkle. And being reminded again from my husband and my two-year-old’s smile was just perfect. What can you do to make a moment a little more special in your day today? Hope you find a way. I would love you to share a picture or drop me a comment in the comments section. Here’s to the sprinkles on top. So lovely, those ordinary moments always seem to be the ones that affect me so profoundly. It took this little lady to come along in my “older” years for me to really let it sink in and “get it!” Thanks JEN!! This is lovely! I also find myself saying ‘no’ much too often for no good reason. I’m trying very hard to do less of that now.